The n-ABLER Pro Rollerball is specifically designed for computer users with limited hand control, motor skill difficulties, poor hand-eye-coordination, limited manual dexterity, involuntary muscle spasms and hand or wrist tremors. 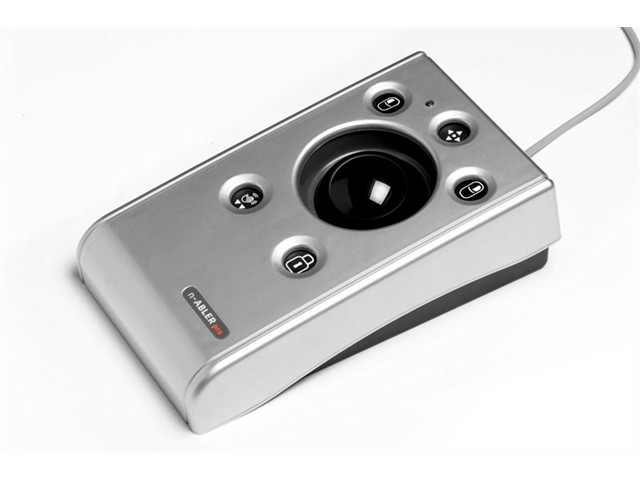 The n-ABLER Pro Rollerball is a computer mouse emulator but, with fingertip control requiring only minimal hand movement, reduces wrist and elbow fatigue. The symmetrical design allows users to work with either hand without angling the wrist, and the unit can also be configured for 'left-handed' operation. A large, integrated hand/palm rest makes work posture more relaxed, reducing strain and tension. The n-ABLER Pro Rollerball is particularly suitable for all age groups with motor skill difficulties and for those whose work requires long periods at the computer. The 'Anti-Tremor' facility is invaluable for anyone suffering with tremors or involuntary muscle spasms and for older people with movement impairment. Symmetrical design for use with either hand, with Integral wrist support to minimize fatigue. control. Cursor Speed can also be controlled.